The time of the year when you get to dig out your spookiest outfit has arrived again. Are you looking forward to dressing up and scaring people with your costume? We know you’re excited, but don’t get ahead of yourself. Tick off some of these items first from your list of Halloween preparation. Halloween party plans? Check. Spooky costume? Check. Well, what about a Halloween make-over? This year, say no to tricks and go for an all treats Halloween celebration with Elite Nails’ Spooky Treats. You can choose a make-over package that suits your beauty regimen from among a range of choices. Starting from Php800, you can get the pampering and relaxation you need before all the hype and excitement of the Halloween starts. For a perfect set of nails, you can get our Elite Spa manicure and pedicure packages. Not only will you have a Halloween-ready nail polish, you will also enjoy fair and young-looking hands and feet. For your face and body, make sure you try our facial and body scrub packages that will help you maintain your skin’s optimal health and ensure that you have fair and beautiful skin. Not only that, you can choose a package that comes with a massage for a day of absolute relaxation and pampering. Choose your treat now! Spooky Treats promo runs from October 1 to November 15, 2015 only. 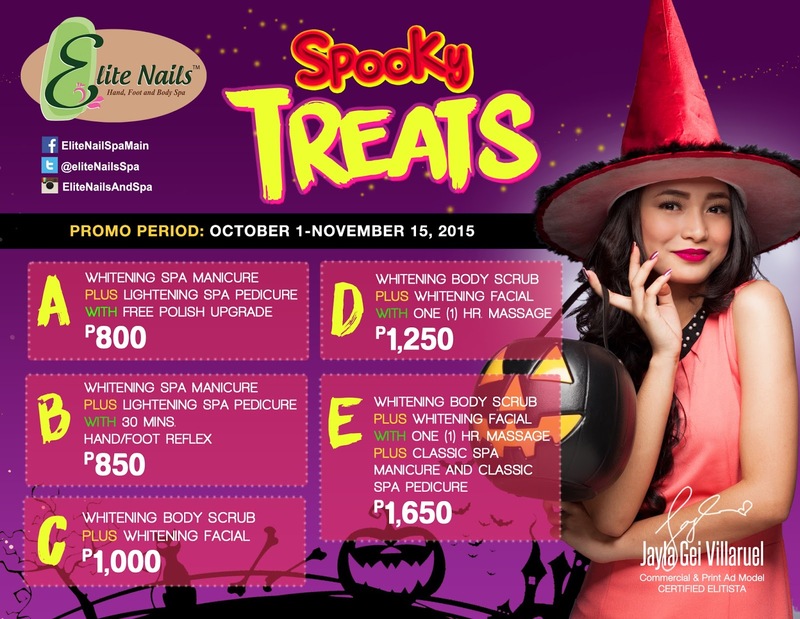 So hurry to the Elite Nails branch near you and have a spook-tacular Halloween!